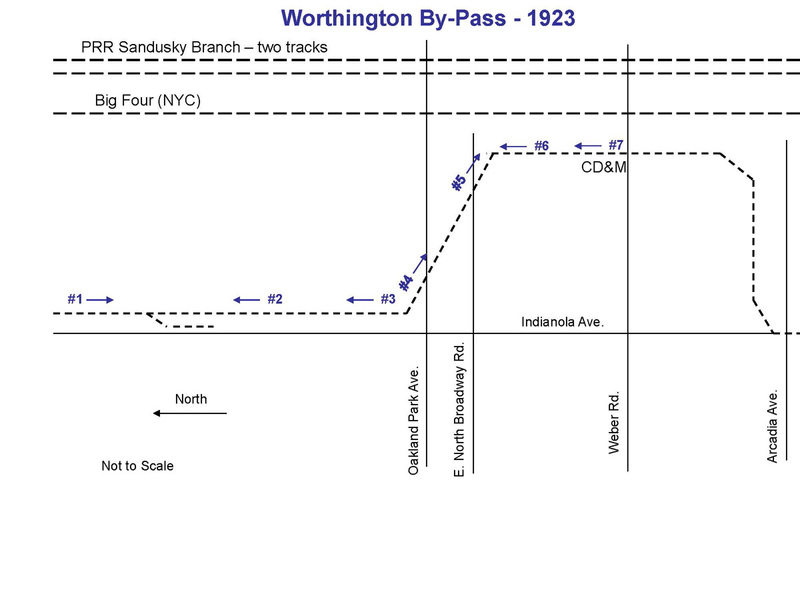 Map of the southern end of the Worthington bypass showing the camera locations and direction for the seven slide show photos. The new private right-of-way was about 6.5 miles long. The map shows the southern third of the new route. The track, going north, came off Indianola Ave and turned east along the northern edge of Glen Echo ravine. It then turned north along the Big Four/PRR tracks until E. North Broadway where it took a sweeping 'S' curve to run alongside Indianola Ave. Further north it would turn east back to the west side of the Big Four/PRR tracks again. About 1/2 miles north of SR 161 in Worthington it turned west for about one mile where it joined the original CD&M route near N. High Street and Worthington Galena Road. When the Columbus Delaware & Marion Railway Co. was formed in the early 1900's it took a rather combersome path between central city Columbus and the start of its private right-of-way just north of Worthington. From the interurban loop in Columbus it headed north on Third Street, turned east on Chestnut Street for one block, north on Fourth Street where it crossed over the multiple tracks leading into the Columbus Union Station, turned west on Warren St. for two blocks, north on Summit Street, west on Hudson Street for one block, north on Indianola for one block, west on Arcadia Avenue and finally north on High Street. All of this was street running until it reached that private right-of-way. By the early 1920's heavy automobile traffic and the eastbound hill on Arcadia Avenue slowed the schedule making the Columbus-Marion run longer than it should be. Also pulling four car freight trains up Arcadia Avenue often required doubling the hill, a time consuming operation. The solution to the problem was to build the Worthington bypass which eliminated Arcadia Avenue and North High Street from the route. The bypass started at the Indianola Ave point of the route, described above, where the CD&M entered private right-of-way just north of Glenn Echo Ravine generally following the Big Four/PRR Sandusky Branch to just north of SR 161 where it turned west taking it back to the original right-of-way north of Worthington at Worthington Galena Road. The slide show photos were taken in 1923 during the bypass construction and are from the Dave Bunge Collection.